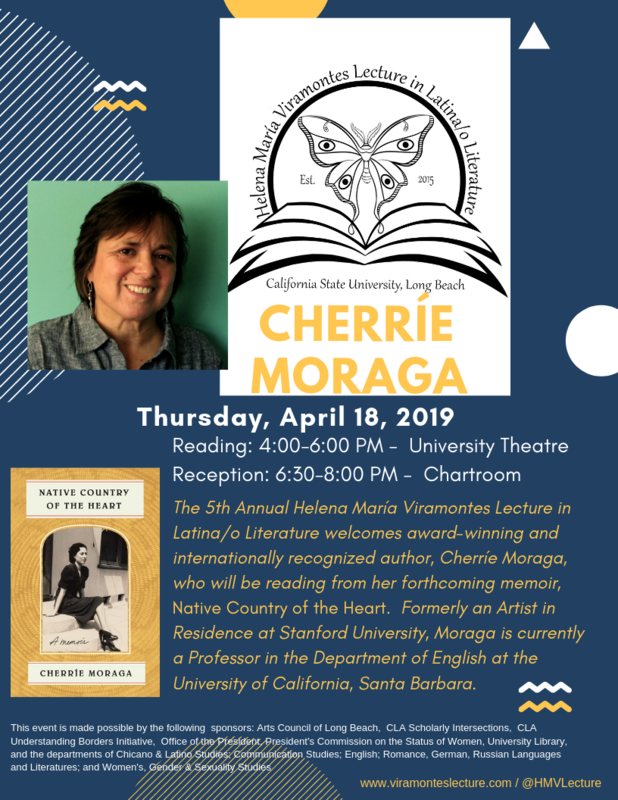 The 5th Annual Helena María Viramontes Lecture in Latina/o Literature welcomes award-winning and internationally recognized author, Cherríe Moraga, who will be reading from her forthcoming memoir, Native Country of the Heart. Formerly an Artist in Residence at Stanford University, Moraga is currently a Professor in the Department of English at the University of California, Santa Barbara. This event is made possible by the following sponsors: Arts Council of Long Beach, CLA Scholarly Intersections, CLA Understanding Borders Initiative, Office of the President, President’s Council on the Status of Women, University Library, and the departments of Chicano & Latino Studies; Communication Studies; English; Romance, German, Russian Languages and Literatures; and Women’s, Gender & Sexuality Studies.